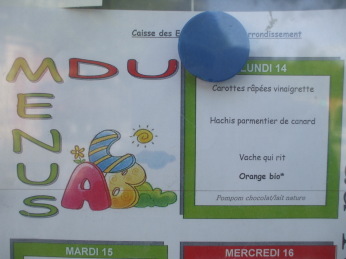 What do French schoolchildren eat for lunch? 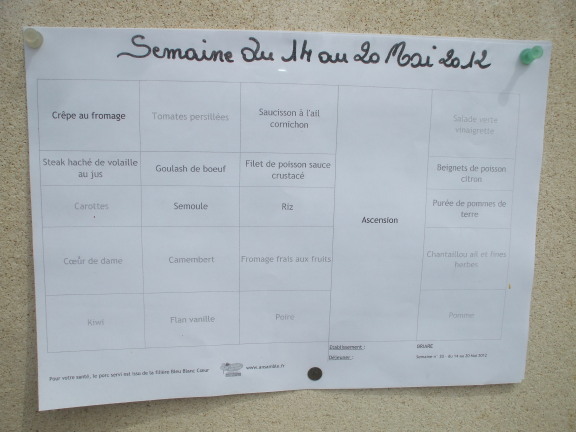 French school lunches are very different from those in most other countries, especially those in the U.S.
French children are in school all day, even in the maternelle (roughly equivalent to U.S. kindergarden) and in the pre-school before that. Education covers life at large, including nutrition and meals. 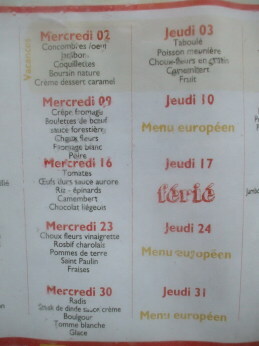 For the French, learning how to eat a meal and appreciate diverse foods is like learning how to read, write and do arithmetic. Vegetable starter: leafy green salad or sliced or grated vegetables. 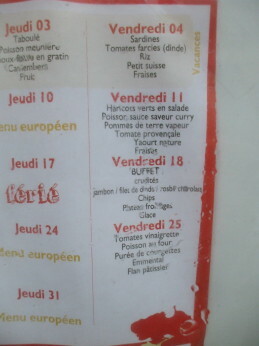 The warm main dish, which includes a vegetable side dish. Dessert is fresh fruit four times a week with a sweet treat on the fifth day. Within any four-week period (20 meals), only a maximum of four main dishes and three desserts can be high fat. Similarly, fried food is limited to four meals per month, likely the same four high-fat main dishes. Ketchup can only be served once per week, typically with the once-per-week fries, and only a limited amount provided with the meal. Many school simply don't serve the high-sugar high-salt ketchup at all. No sweetened and flavored milk, water is served. 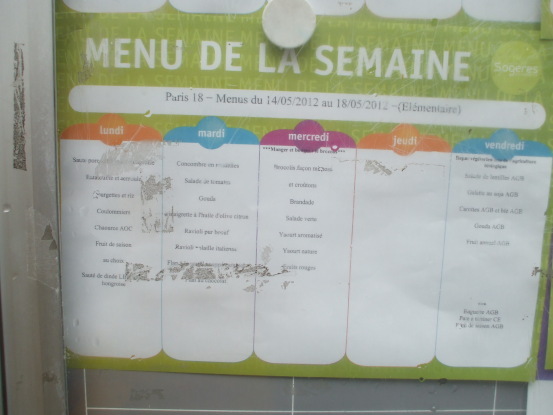 No daily menu may be repeated within a month. The municipal government can set prices within the constraints of the national law's maximum limit and sliding scale. 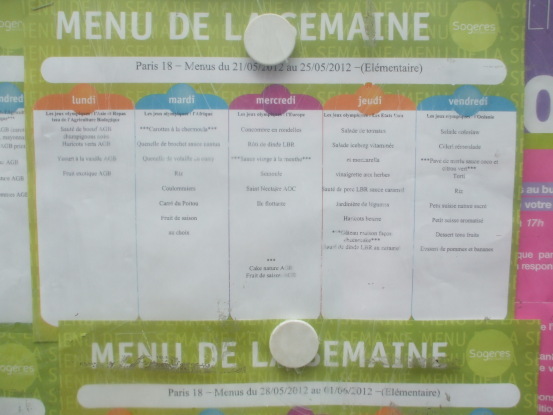 The result is that, on average, a school lunch costs something like €2.30–2.80. The very wealthiest families might pay €5.40 per meal while those with the lowest of incomes pay €0.15 and free meals are available for those who can't pay. 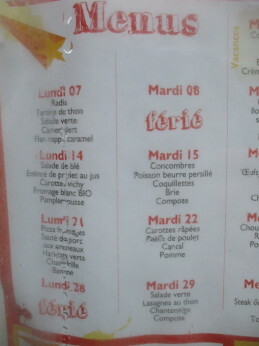 Vending machines are prohibited in French schools. Parents are strongly discouraged from sending their children to school with sack lunches, and very few do. All this comes from the Ministry of National Education, formally known as the Ministère de l'Éducation nationale, de la Jeunesse et de la Vie associative, indicating the sports and other physical activity are also considered a crucial part of French life. 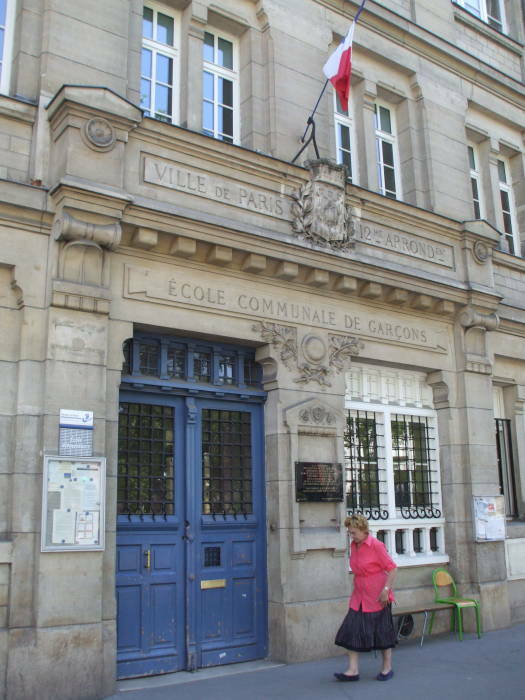 Above we see what was formerly l'École Communale de Garçons or the Public School for Boys in the 12th Arrondissement of Paris. It's along Avenue Daumesnil facing the Promenade Plantée, near Gare de Lyon. 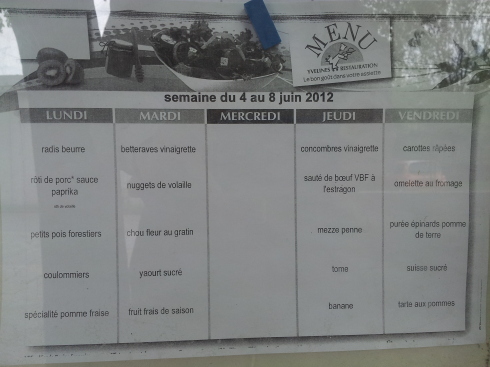 The case to the left of the door has the week's menu posted, as required by law. Let's check it out. This school also lists its breakfasts. 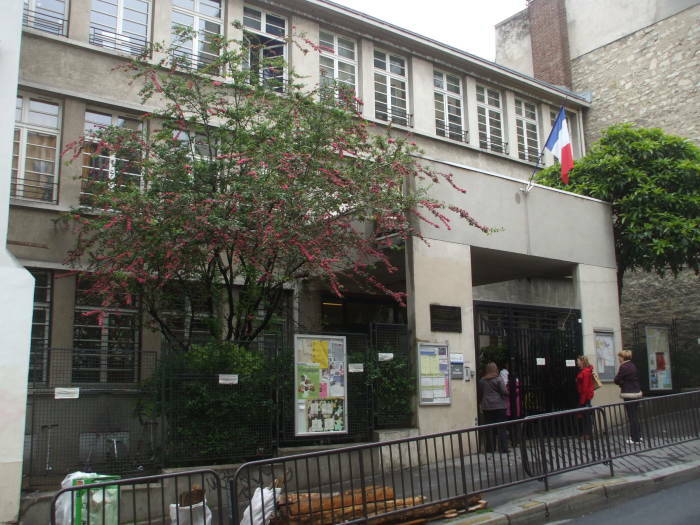 This next school is in the 18th Arrondissement of Paris, going up the hill from the Pigalle Métro station toward Montmartre. 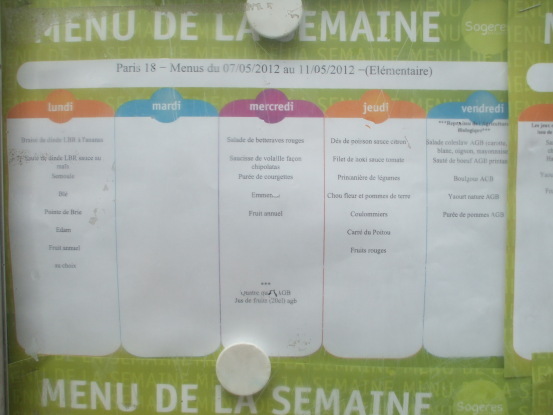 The case near the entrance holds various announcements, including four weeks' of menus. 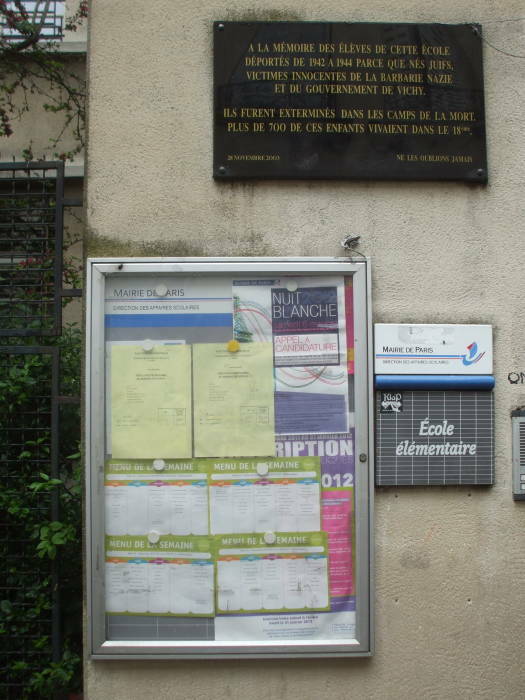 The dark plaque above is in memory of the students from this school who were deported by the Germans and killed in extermination camps, with the assistance of the Vichy puppet government. 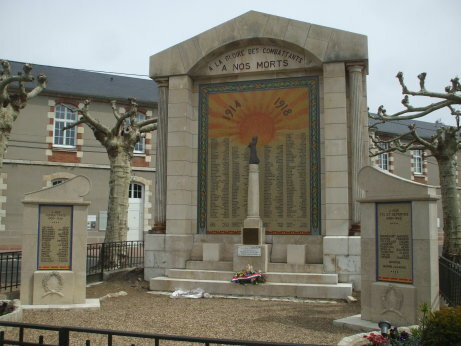 About 700 children from the 18th Arrondissement alone were killed in the German death camps. Ferie Holiday — V-E Day, German troops agree to an unconditional surrender on this day in 1944. 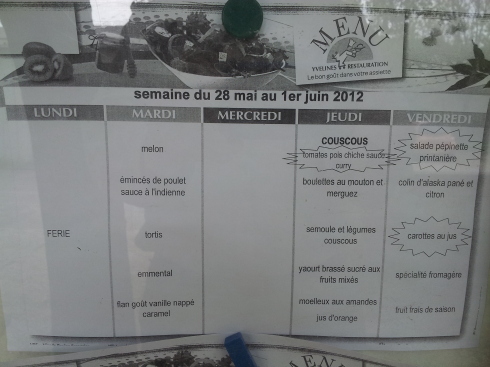 The second week's menu is too hard to read in my picture, it was behind some old tape and I didn't notice it at the time. Let's move on to the next one. Briare is a town with a population of about 5,660, about an hour by regional train south of Paris, on the Loire River. The municipal school in Briare is in a rather uninteresting building. I believe it is housed in former warehouses along the Briare Canal. The canal's construction started in 1604, and it opened for transport in 1642. It was the first European summit level canal built with pound locks. Those are the now-standard locks with gates at both ends controlling the water level within the pound, the enclosed space between the gates. The design was first constructed by the Chinese engineer and government official Qiao Weiyo in 984. In Europe, the design first appeared in the Netherlands. This World War I monument is along the canal, the school is in the background directly behind. 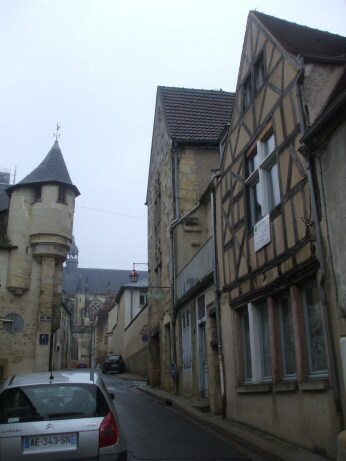 There is a school very close to the large cathedral in the old city of Nevers. 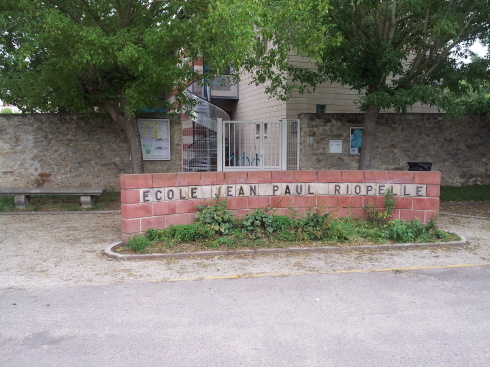 The École Jean Paul Riopelle is the elementary school in Vétheuil along the Seine river between Paris and Rouen. The school group shown at the top of this page was returning to here for their lunch. Holiday The anniversary of the D-Day landings in 1944 are a national holiday in France. 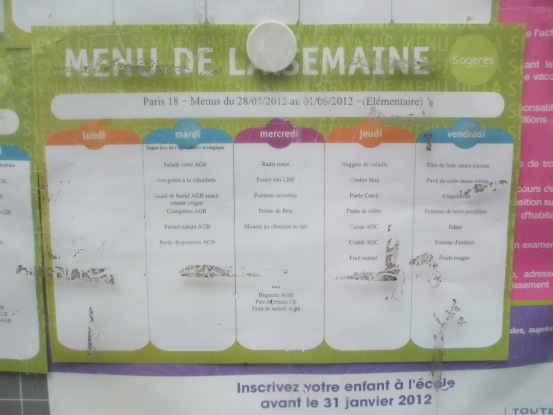 In the U.S., Time magazine's "School Lunches in France: Nursery-School Gourmets" seems to have been one of the articles that drew significant attention in America to French school menus. Related to this, see the CBS News story "Why my child will be your child's boss", which explained how Swiss school children are regularly taken into the forest and allowed — no, required — to use saws. Lenore Skenzay's book Free-Range Kids describes how a U.S. high school principal threatened to suspend a group of seniors (that is, 18 years old, in their final year of school) for the "dangerous act" of riding their bicycles to school, and a group of parents protested because their 17- and 18-year old children were sent home from school on a train without an adult supervisor. Meanwhile Swiss children as young as three are given saws to play with, and their kindergarten system advises parents to let 4- and 5-year-old children walk to school alone. 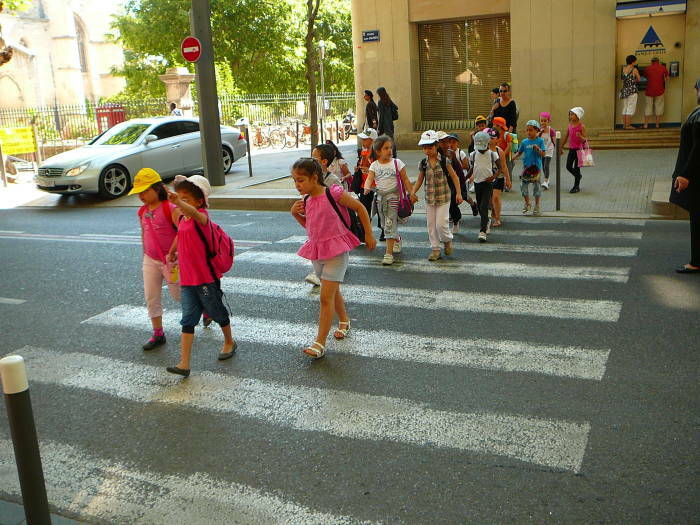 A French school group crosses the main street through the center of Avignon's old town. They are managing to cross the road without the aid of multiple adults in reflective vests stopping traffic. Incroyable! 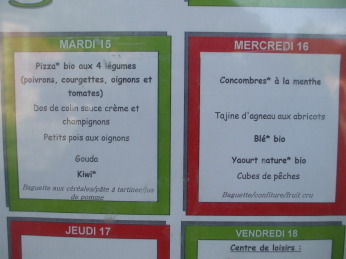 Then there are American school lunches and their concept of ketchup as a vegetable and frozen pizza as a vegetable. Ronald Reagan's FY1982 budget proposed US$57 billion in spending cuts, This budget was modified and passed as the Gramm-Latta Budget, cutting US$1 billion from the school lunch program while significantly increasing military spending. The U.S. Department of Agriculture or USDA was then tasked with the impossible task of maintaining nutritional requirements for school lunches despite the loss of a billion dollars in funding. By 2011, USDA standards accepted just two tablespoons or 30 ml of tomato paste as counting for a full serving of vegetables. This allows a slice of cheese and meat pizza to also count as a full serving of vegetables. * "Nutrition Standards in the National School Lunch and School Breakfast Programs", USDA Proposed Rule, Federal Register vol 76 no 9, January 13, 2011. The U.S. Congress would have nothing to do with that healthy nonsense, and quickly passed a bill barring the USDA from changing its existing nutritional guidelines. This was an enormous victory for manufacturers of pre-processed French fries and frozen pizza. The American Frozen Food Institute is a trade association that lobbied heavily and successfully on behalf of frozen pizza manufacturers including ConAgra and Schwan Food Company, and French fry manufacturers McCain Foods Ltd and J.R. Simplot Company, the last of which was already a supplier to McDonald's. 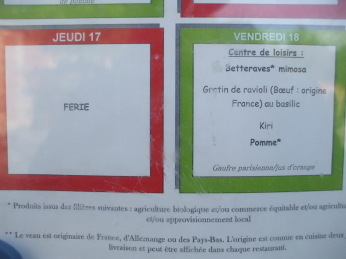 Meanwhile the actual French people, including their school children, eat only a tiny fraction of the amount of "French fries" consumed by their American equivalents.